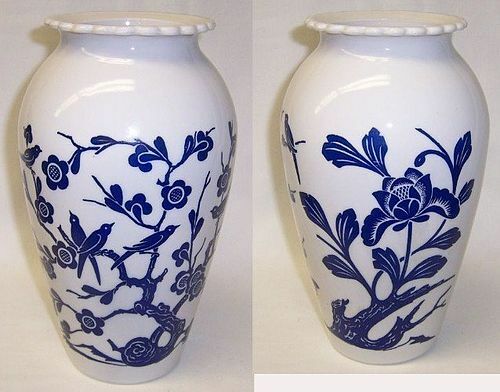 This really pretty Vitrock 9 inch high Vase, with Blue Birds and Flowers, was made by Anchor Hocking. This Vase measures approximately 5 inches in diameter at the widest part. It is in very good condition with no chips, cracks or scratches. The bird and flower decoration is all very good. We guarantee items to be as described. THANK YOU. This really pretty Fired On Cobalt Rainbow Tilted 80 Ounce Ball Jug with Ice Lip was made by Anchor Hocking. 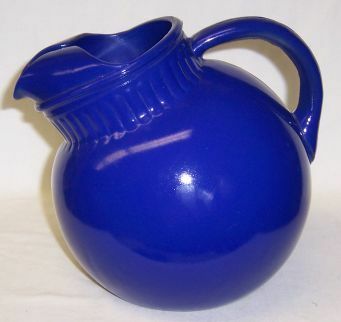 The Jug measures 7 1/2 inches high to the top of the handle. It is in very good condition with no chips or cracks. You have to hold it up to the light to see that there are a few minor scratches near the bottom of the jug - very minor but there. We guarantee all items to be as described. THANK YOU. 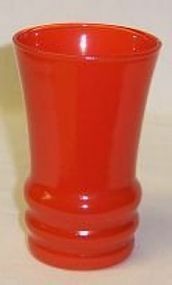 This really pretty Fired-On Orange 3 3/4 inches high Juice Tumbler was made by Anchor Hocking. This Tumbler measures 2 3/8 inches in diameter across the top and is in very good condition with no chips or cracks. The fired on paint is all very good. Be sure to search our other Hocking glass available. We guarantee all items to be as described. THANK YOU. This really pretty Amber Boopie 5 1/2 Inch high Water Tumbler was made by Anchor Hocking in the 1950s. This Tumbler measures 3 inches in diameter at the top and is in very good condition with no chips, cracks or scratches. Be sure to search our other Anchor Hocking available. We guarantee items to be as described. THANK YOU. This really pretty Azurite blue Charm Cup and Saucer Set was made by Anchor Hocking from the 1940s to the 1960s. The Cup measures 3 1/2 inches across. 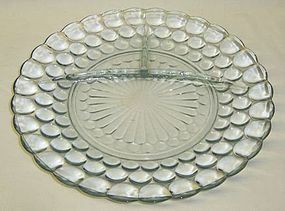 The Saucer measures 5 1/4 inches across. Both the Cup and Saucer are in very good condition with no chips or cracks. Be sure to search our other Fire King available. We guarantee items to be as described. THANK YOU. This really pretty Azurite Blue Swirl 5 7/8 Inch Cereal Bowl was made by Anchor Hocking for their Fire King line. This Bowl is in very good condition with no chips, cracks or scratches. It is signed on the back Fire King Oven Glass. Be sure to search our other Swirl available. We guarantee all items to be as described. THANK YOU. This really pretty Azurite Blue Swirl 7 5/8 Inch Soup Bowl was made by Anchor Hocking for their Fire King line. This Bowl is in very good condition with no chips or cracks. There are just a couple very light surface scratches in the bottom of this bowl. It is signed on the back Fire King Oven Glass. Be sure to search our other Swirl available. We guarantee all items to be as described. THANK YOU. 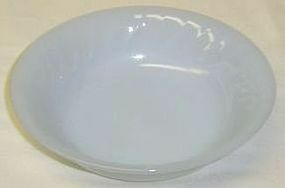 This pretty blue Bubble 7 3/4 Inch Flat Soup Bowl was made by Anchor Hocking from 1941 to 1965. 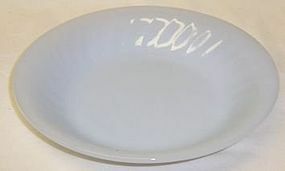 The Soup Bowl is in very good condition with no chips, cracks or scratches. Be sure to search our other Bubble available. We guarantee all items to be as described. Feel free to email with any questions. THANK YOU. This pretty blue Bubble large Berry Bowl was made by Anchor Hocking from 1941 to 1965. This Bowl measures 8 inches in diameter X 2 3/4 inches high. It is in very good condition with no chips, cracks or scratches. Be sure to search our other Bubble available. We guarantee items to be as described. THANK YOU. 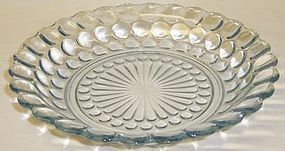 This really pretty blue Bubble 9 3/8 Inch Divided Grill Plate was made by Anchor Hocking from 1941 to 1965. This Plate is in very good condition with no chips, cracks or scratches. Be sure to search our other Bubble glass available. We guarantee items to be as described. Email any questions. THANK YOU. 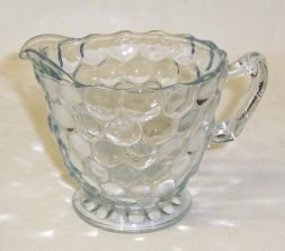 This really pretty Blue Bubble 3 Inch high Creamer was made by Anchor Hocking from 1934 to 1965. This Creamer is in very good condition with no chips or cracks. Be sure to search our other Bubble items available. We guarantee all items to be as described. Feel free to email any questions. THANK YOU. 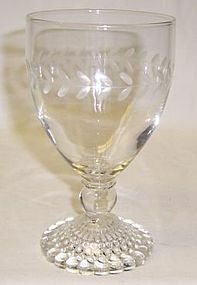 This really pretty crystal Bubble 5 1/2 Inch high Cut Laurel Band Goblet was made by Anchor Hocking from 1941 to 1965. 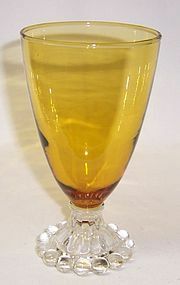 This Goblet is in very good condition with no chips, cracks or scratches. 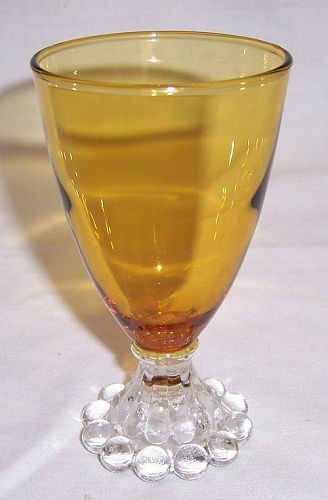 This Goblet can be hard to find. Be sure to search our other Hocking glass available. We guarantee all items to be as described. Feel free to email any questions. THANK YOU. 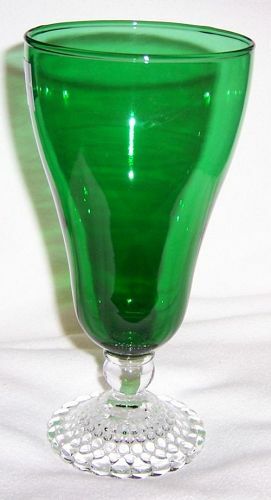 This pretty Forest Green, with crystal foot, Burple 3 1/2 inch Cocktail was made by Anchor Hocking into the 1960s. 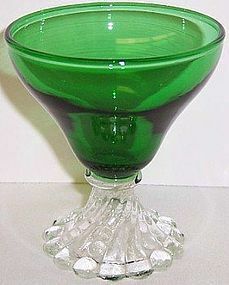 This Cocktail measures 3 1/8 inches in diameter across the top and is in very good condition with no chips or cracks. Be sure to search our other Burple available. We guarantee items to be as described. THANK YOU. 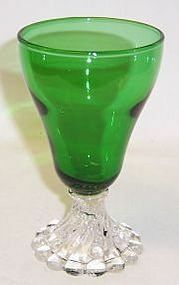 This pretty Forest Green crystal foot Burple 5 Ounce Juice Tumbler was made by Anchor Hocking into the 1960s. This Tumbler measures 4 1/2 inches high and is in very good condition with no chips or cracks. Be sure to search our other Burple available. We guarantee all items to be as described. Feel free to email any questions. THANK YOU.